Minneapolis Minnesota May not always be “on the map”, but it definitely was for the Super Bowl this year. Although the Vikings have never won a Super Bowl in their 57 years, they have made it 4 Times. This holiday season they made it to the playoffs against the Chicago Bears. Venturing from the parking garage through the security line into the stadium was the longest and coldest venture of my life. When it is -14 and feels like -30 you do not want any patch of skin exposed to the cold. Peeling off my coat to walk through the metal detector outside was brutal as my fingers and toes already felt like rocks. But once we were inside the warmth brought me back to life. The stadium is BEAUTIFUL. With a $975 million dollar price tag, I would not have expected anything else. 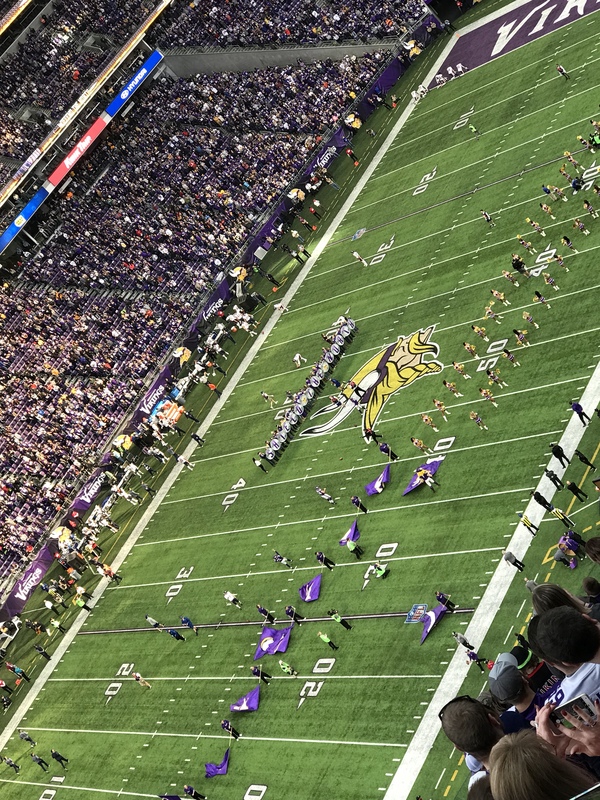 From the Vikings fans dressed up as true Vikings, to people in snow pants, and others in full face paint, it was an amazing game. My Look: I paired a Vikings apparel t-shirt with some Helmut Lang jeans, white booties, and a purple pom hat.